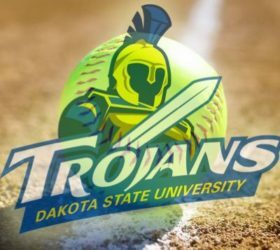 The Dakota State Trojans softball team enters their last weekend of play against conference foe Jamestown (ND) and Viterbo (WI) at home for a Friday/Sunday series with the Jimmies and V-Hawks. The Ladies will look to add to their already impressive season as they currently sit at 18-25 overall, and 12-12 in the conference. They currently sit in the 5th seed position for the tournament but could find themselves climbing up with a good weekend and some losses by the other teams. The Ladies already have the most wins in a season since 2007, when they had 19, and they also broke a 10-year old record in single-season home runs; they had 28 in 2008 and 31 currently in 2018. The softball team will also honor their lone Senior, Kelly Drake, on Sunday following her illustrious career. A transfer Junior a year ago, Kelly has found herself at the forefront of the Trojans pitching staff, having thrown over 250 innings with 26 complete games. 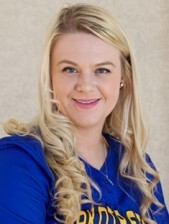 She also holds the single-season school record for innings pitched in a game, 10 innings vs Mount Marty (SD). In her to-date career at Dakota State, she has collected 12 wins and 1 save. The Trojans will finish up regular season play this weekend and shift their focus to the conference tournament, which will be held in Aberdeen, SD next weekend, May 3-5. The Jamestown Jimmies currently hold the top seed in the conference while the Trojans hold the 5th seed, and Viterbo sits in last. If the Trojans can reach the tournament, they will return to postseason play following last year’s hiatus. The Trojans play at home today for the first time in 43 games. They host Jamestown (ND) at 2 p.m and 4 p.m at Thue Softball Complex and then will round out the season with Viterbo (WI) on Sunday at 12 p.m and 2 p.m.